For Christmas this year, I’m going back to making things. I’m pretty excited about it actually. I decided to make today a lazy, no-sew day but I still wanted to be crafty and make something. So I dug out my bottle of Mighty Mendit and some fabric remnants from Jo-Ann’s. Today I’m bringing you part one of this project, check back for part two. I’m splitting it up to allow for drying time with the Mighty Mendit , which calls for 2 hours before it’s wearable and 24 hours before it’s washable. I’ll play it safe and give it an extra long drying time. Step 1: Pick out some fabric and get out your scissors, Mighty Mendit , measuring tape, and something to keep the cats out of your way. Muffin runs away from kisses. See if it works for you! Step 2: Cut two pieces of equal size. I made squares. You can do squares too. Or maybe try rectangles, or circles! 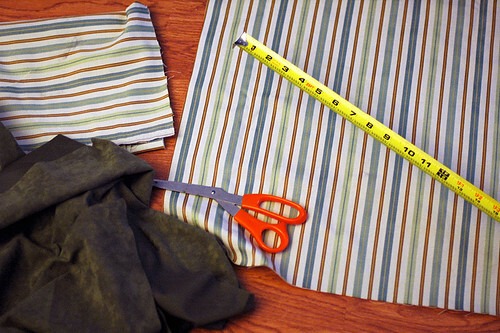 This is where your measuring tape comes in handy, to make sure your pieces are the same size! 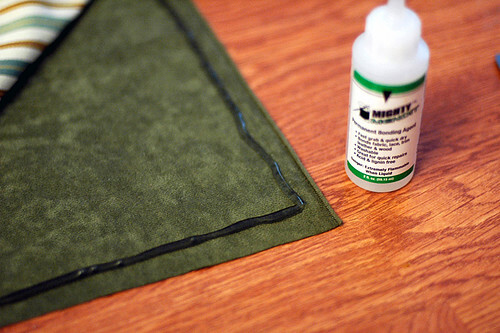 Step 3: Place the two pieces face to face and put a thin line of glue Permanent Bonding Agent close to but not too close to the edge on one of the pieces. Carefully lay the other piece on top, making sure to line everything up as evenly as possible. Make sure to leave a gap where you don’t put any glue stuff so you can turn it inside out later. Step 4: Put it somewhere safe, on something that you don’t mind potentially getting glue Permanent Bonding Agent on. For me this is a room where the kitties are not allowed. Step 5: Wait. Give it a good long while to dry. While we’re waiting, a note on Mighty Mendit : The information I’ve read on this stuff makes a point to note that it is NOT GLUE. It’s not glue, it’s just a sticky, liquid bonding agent that you can use to affix one thing to another. But it’s totally not glue. What?